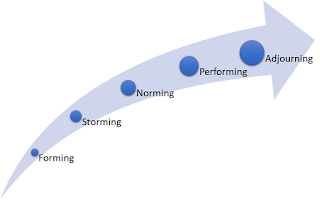 Better Projects: Forming, storming, norming, performing...then what? Forming, storming, norming, performing...then what? In the last 15 years or so there has been a strong movement to creating stable teams and running work through them, rather than forming teams around the work. There are plenty of case studies showing how and why this is a better approach. Years into this approach we get to ask a new question. When you move through Tuckman's stages of team development but you don't move to adjourning what do you see next? It's worth revisiting the basics; Tuckman's model skews to the team formation processes. It's not surprising that performance only comes in to focus in stage three. Different behaviours are exhibited at each stage. At the early stages people are polite, sensing out the situation and the power dynamics, finding their place in the group. At a certain stage tensions will start to emerge as different perspectives and egos come into conflict. Eventually it will all settle down and people know how to get along and work together. This transition to a performing team can take hours to months depending on the people and situation. 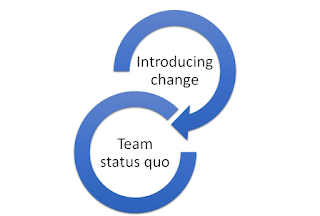 When teams are disbanded and people move on to new adventures they then go through this cycle again. Two years later in one team, what's going on? What about eight years later? There will probably be some churn even in a high retention team. But swapping out one person a year won't change the power dynamics in the team. The way we do things around here will remain the same. The worldview of the collective and the individuals in the team won't typically allow for new perspectives. Pretty soon the new person settles in and soaks into how we do things around here. So change can come to the team in small dis-empowered increments or it can come with the power to make change. The roots of that power are organizational authority in the scenario where management hires in a consultant or change agent. It is done with consent and authority based on expertise. It is also pretty clear these days that change comes best when the change effort is sustained over time. We know consultants can't turn up, spend a short time dispensing advice and expect change to magically happen. New habits need to be formed, bad habits need to be eroded. Where does this get me? Once again; two thoughts. Generating an appetite for change in teams is a core part of making a team a successful unit. Some people naturally have this. It is linked with Impostor syndrome which is also linked with high performance, or possibly a better link is the Dunning Kruger effect, where smart people tend to think they are just normal and persistently seek smarter/better outcomes than they are able to achieve. Management/executive teams are the higher yield place for coaches and change agents to be applied than long term front-line teams. Management groups have a far greater influence on how the local system of work is bounded and operated. So nothing radical or new, but theory underpinning beliefs about how work works is always reassuring.